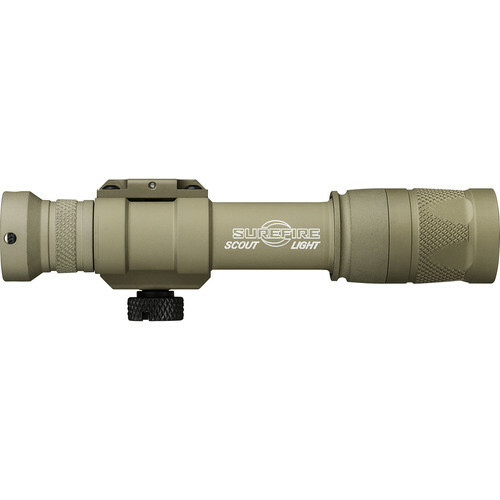 Be aware of your surroundings within dark situations with the tan M600V IR Scout LED WeaponLight from SureFire, which provides shooters with a powerful white light of 350 lumens. The M600V can be easily mounted to a Picatinny rail by tightening its thumbscrew. For use with night vision devices, it also offers 120mW of invisible infrared output. The IR or white modes on the Scout Light can be activated by rotating a knurled collar by the tailcap shroud. Momentary and constant-on actuate with a click of the shrouded tailcap switch. The flashlight has a bezel diameter of 1.1" and a Total Internal Reflection (TIR) lens that creates a pre-focused high-intensity beam for close to medium-range applications. By twisting the flashlight's V-series head you can change the beam's intensity. With two CR123A batteries the white LED will run for 2.5 hours, or the infrared LED will run for 16.8 hours. The Scout's aluminum alloy is anodized with a hard coat for abrasion and corrosion resistance, and O-ring sealed for weatherproof and dust-proof performance—making this tactical accessory ready for just about any battlefield condition.